The flowers of Asian Pear on the long-lived tree are a popular symbol of early spring with magnificent white blossoms almost completely covering the tree. 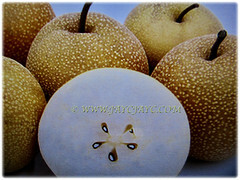 Korean Pear produces edible fruits that are firm, very crisp, hugely juicy and sweet as well as highly aromatic in some varieties. 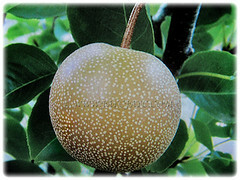 Botanical Name: Pyrus pyrifolia (syn. 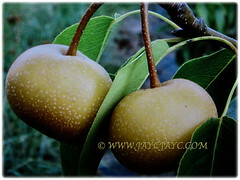 : Pyrus serotina, Pyrus aromatica). 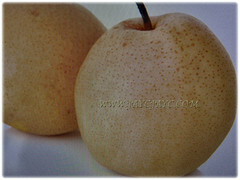 Common Names: Asian Pear, Chinese Pear, Korean Pear, Japanese Pear, Taiwanese Pear, Sand Pear. Origin: Native to eastern Asia that includes China, Korea and Japan. Plant type: An ornamental fruit-bearing tree. 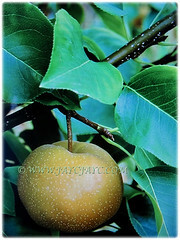 Features: Pyrus pyrifolia is from the genus Pyrus that comprises of about 40 species. It is an upright-growing tree with medium to fast growth rate and grows up to 10 m tall with a rounded crown that may spread 6 m or more across. Trunks may be 30 cm or more in diameter. Its stems will be covered with simple medium green, oval-shaped and petiolate leaves with slightly toothed margins. The white flowers which are borne in umbels are hermaphrodite with both male and female organs. Flowers are 2.5-3.75 cm across with five petals, five sepals, many stamens and a single pistil. They are pollinated by insects. Eventually, the flowers will be followed by fruits that are firm, very crisp, very sweet and juicy. Fruits are borne on spurs, 2.54-7.62 cm twigs that are on 2-6 year-old branches. 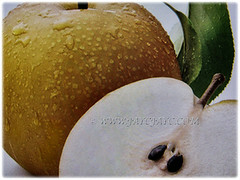 Each apple-shaped fruit is between 3-5 cm in diameter and has a smooth and golden russeted, light yellow or yellowish-brown skin with five seeds inside. 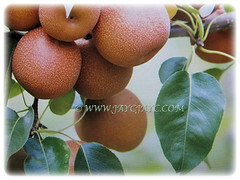 Culture (Care): Pyrus pyrifolia or Asian Pear can be grown easily with least maintenance. Light: Prefers full sun, though grows well in semi-shade too. Moisture: Medium water requirement. It can tolerate drought once established. Soil: Fertile, loamy or heavy clay, moist and well-drained soils. Others: Remove any dead, broken, diseased or crossed branches. Prune the tree of Asian Pear once annually. Do not over feed the plant as it can lead to fireblight, a severe bacterial disease. Once monthly, feed the tree with a balanced granular fertiliser to stimulate growth and fruit production. 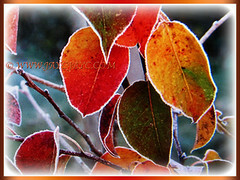 Generally free from serious pests and diseases. Nevertheless, watch out for caterpillars, leaf roller, blister mites, aphids, scale insects and powdery milder. They are susceptible to fireblight, canker, pear scab, fireblight and codling moth (Cydia pomonella). For subtropical and temperate regions: Hardiness: USDA Zone 5a-9. 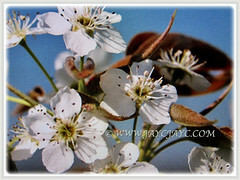 Pyrus pyrifolia or Sand Pear is a deciduous tree that grows to 10 m tall and it’s not frost tender. This beauty is extensively cultivated for its edible and sweet fruits in cool, humid and temperate regions throughout the world. The tree should be pruned in winter to allow light in for the fruits and promote air flow which minimises disease. Asian Pear require some summer heat to fully develop its sugar content and fruits must ripen on the tree to reach their full flavour. The fruit tends to be quite large and fragrant and when carefully wrapped, it can last for several weeks or more in a cold and dry place. Besides being a tree that’s laden with edible fruits, this floriferous tree has very ornamental leaves that provide delightful autumnal colours. 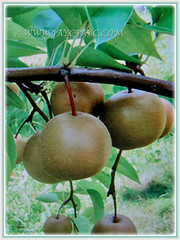 Propagation: Can be propagated from seeds but pears do not come true from seed. Hence, best to propagate vegetatively by chip- or t-budded onto compatible rootstocks. 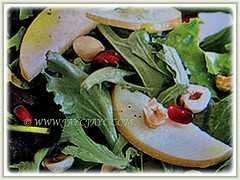 Usage: Pyrus pyrifolia or Korean Pear’s fruits are high in fiber and low in calories. It contain a number of micronutrients that are important for blood, bone and cardiovascular health. It contains enzymes that tenderise meat and are used in marinades. The firm, crispy, sweet and juicy fruits can be eaten out of hand, canned or used in fruit salads, pies, stir fried or baked. An excellent accent tree that’s large enough to be used as a small shade tree. It is known to be antiseptic, astringent, febrifuge, nervine and pectoral.